The Tsunami Animal-People Alliance specializes in Catch-Neuter-Vaccinate-Release (CNVR), which has been proven to be successful as a humane method of managing dog populations in countries such as Sri Lanka, Indonesia, Thailand, and India. 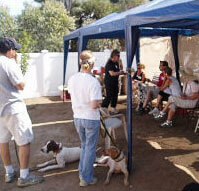 CNVR is a quick and efficient way to manage community dogs. When done using modern surgical techniques and materials, it does not require days of sheltering for recovery before the animals can be released safely back to their own territories or to their owners. Usually the animals can be released the same day, with no further treatment required, and without requiring sheltering during recovery, which is the logistical weak link of non-same-day release methods. Many people find the same-day release concept difficult to accept, but it is similar to the advances in human childbirth. Not that many years ago, the mother would be required to stay in the hospital for as many as five days. As a result of improved techniques and medications, new mothers now often spend less than a day in the hospital. Same-day release methods are being adopted world-wide for mass sterilisations, and mobile field clinics have been used for over 10 years as an effective way to implement same-day CNVR. TAPA has adopted the field clinic protocols developed and refined through the Yudisthira Foundation on Bali in Indonesia over the last ten years. In Sri Lanka, TAPA has done over 54,000 spay/neuters using these protocols, with a mortality rate of less than 0.2% (0.002). Fatalities are primarily due to anesthetic risk, not post-surgical complications. Surgery in mobile and tent-based clinics allows us to move right into the community, but at the same time, we use the same asepsis and surgery protocols as a regular office clinic environment. We do not and will not compromise on materials, equipment, asepsis, surgical standards, or operating procedures. Same day CNVR works well, but only when it is very well implemented. We sterilise males and females: we do both as a population control means, but we also do the males to reduce their aggressive behaviour during mating season, which often causes problems for people, such as dog bites. Thus we can address improving the welfare of people as well as that of the individual dogs who might be put at risk. The female dogs also end up in better condition, not constantly exhausted from producing puppies and supporting their litters. After sterilisation, the male dogs are calmer and fight less. And without litters of puppies to protect, the females no longer have to invoke aggressive protective behavior. The animals are also healthier after we treat them for skin problems and parasites, and the rabies vaccinations reduce the risk of disease to humans. Members of the local community constantly mention to TAPA personnel that their dogs and the community dogs are in general leading much better lives. This all contributes to a higher standard of welfare for both the animals and the people of Sri Lanka. About 50% of the dogs we sterilise are brought to us by their owners. The other 50% (community/stray dogs) are caught in nets on the end of a pole (like an oversized butterfly net) and brought to the field clinic in a TAPA van. Netting is much less dangerous to the animals than snare poles, and it provides an effective way of calmly and quietly holding them until surgery prep. Dog catching with nets looks easy when done by our team (see the video clip) — but it actually requires great skill and is a crucial part of maintaining an efficient flow of animals through the sterilisation process. The net’s handle is removed after catching to facilitate transport. 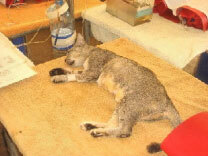 We seek to sterilise and vaccinate at least 75% of the animals in an area. A minimum 75% sterilisation level is the guideline for attaining zero population growth, while a minimum 75% anti-rabies vaccination penetration is the guideline for attaining a “herd immunity” to rabies. We actually do as many as we can, hoping to reach the 90-95% range (and then return on a future field rotation to get those missed). We also sterilise cats who are brought to us. 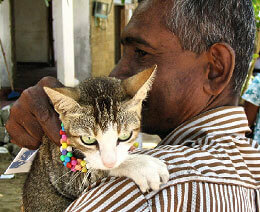 Additionally, when a severe cat overpopulation is detected in a small area, we will also catch cats for sterilisation. Dog or cat is weighed (still in the net), and a drug package is prepared based on this weight. Basic physical exam is conducted. Premeds are injected intramuscularly while the dog is still safely in the net (or under owner’s control). IV catheter is put in place for surgery, and the dog is fully anaesthetised. Ear is notched and cauterised for identification, and the surgery site is properly prepared aseptically. Note: One ear of community animals is notched and cauterised to permanently mark the animal has having been sterilised. We have tried red collars, but they soon come off. We have also tried tattoos, but the animal must be caught again in order to lift the ear to see the tattoo (and the fur can also grow back). TAPA has determined that ear notching is the best method for permanent identification that can be seen from a distance to avoid having to re-catch an animal. Muscle layer: Use interrupted sutures, taking big bites of fascia, muscle and peritoneum, using Vicryl or PDS size 0 or 00. Using an interrupted suture instead of a continuous suture means that even in the unlikely event of a suture failure, only a very small portion of the incision will be affected. Subcutaneous and/or Subcuticular layer: Continuous sutures using shorter-lasting suture, such as catgut size 0 or 00. Subdermal: Mattress suture with a subdermal knot, using catgut size 0 or 00. Epidermal: Superglue. But please note that the superglue is neither for strength nor for holding the wound together but instead acts as a seal to prevent infection for up to 72 hours — a long-acting antibiotic is also given to cover this period. The superglue seal also prevents flies from laying eggs in the wound. We have found this protocol sufficient to protect the wound following surgery while the animals move about or lie in the dirt with the superglue acting as a barrier. 72 hours later, the superglue peels off and leaves the wound already healing. The absorbable suture material does not require a return visit to the vet for removal. We also inject pain medication, long-acting antibiotics, and we vaccinate against rabies. 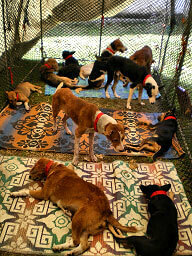 After surgery, the dogs are placed in a covered recovery pen and monitored. After they are well up and about, they are returned to the place where caught or to owners. Interestingly, there are very few territorial issues in the recovery area: each dog’s territory shrinks to almost nothing. The mortality rate for this work in Bali has been extremely low, and follow-ups at two and then four weeks that have been routinely carried out by the field clinic there to all the villages revealed no ill effects. Follow-up studies in Sri Lanka, including relocating and monitoring individual dogs for five days, have revealed similar results. The local people have also been happy to talk about the improvement in the dogs’ conditions, and especially so where skin diseases have been treated. 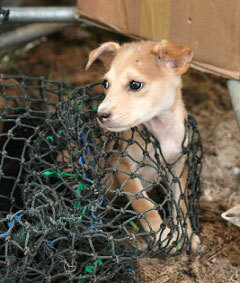 Our goal is to sterilise and vaccinate 6000 animals per year in the tsunami zone and refugee settlements.